Kristin Pluhacek lives and works in Omaha, Nebraska, U.S.A. Her drawings and paintings have been shown extensively in Midwestern U.S. fine arts galleries and museums, and in numerous public and private collections. A participant in several public art projects, she has led many project workshops, among these Lauritzen Garden’s Lewis and Clark Interpretive Icon, and “Reach for Your Dreams”, a collaborative presentation for the 2008 U.S. Olympic Swimming Trials. She is also a book illustrator, her work appearing in the volume Send Me Tulips from Prisma Press. Recently, she designed the stage set for Raskol, a drama produced at the 2012 Great Plains Theatre Conference Playfest. Kristin received her BFA from Creighton Univ., and is a roster artist for the Nebraska Arts Council Artists in Schools/Communities program. 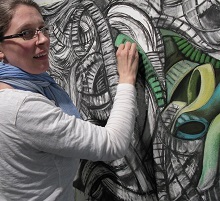 She currently teaches drawing at Omaha’s Metropolitan Community College and the Joslyn Art Museum. Her work is displayed at Anderson O’Brien Gallery and Dundee Gallery, both in Omaha, at MLB Designs in Kansas City, Missouri, and at kkpluhacek.com. I don’t invent; I observe. I look for a strong subject, something that maintains its presence while inviting elaboration and whimsy. Most of these objects are already evident in daily life, their simple, ordinary forms one day exuding a certain grandeur, an unexpected monumentality. Through the interpretation that is my work, I wish to experience and share that energy. Drawing’s directness seems most effective for this action, especially pastels, with their thick layering potential and pure color. I prefer bold forms, with distinct mass, as if carved from negative space. Yet it’s also important that they be light enough to imply potential movement. Hence I often introduce gesture as an overlay above solid shape, defining the form and releasing it from the rest of the composition. Line is always present and purposeful. In practice, I become more aware of the complex design underlying animate and inanimate objects, singularly and in their interactions with the wider world. I am particularly interested in how objects and space encroach upon each other. I freely distort forms for the sake of unity, giving bulk to the space between objects, where both contact and containment occur, while I also distill the subject to an essential form or series of forms. In ribbons, I find an almost architectural quality, how a shift in one aspect may alter the entire structure. An array of ribbons might seem anarchic, but their simple organic motion is soothing, and their infinite relationships yield pleasure. When I work with ribbons, I often think of specific words and phrases–sometimes for their meaning, sometimes their sound or connotation. By limiting choice, these verbal touchstones help tame the chaos, while hinting at connections or latent mobility. On the other hand, the aggressiveness of floral spirals can constitute an act of defiance, exploding from their centers, expanding until they overwhelm, refusing to be curbed. Share the post "Kristin Pluhacek: Gestures"